In business you clearly want people to trust your website. You don’t want people to think you are dodgy in any way. But what do you need to do in order to get people to trust you and therefore increase their likelihood of buying from you? New research suggests you have to gain people’s trust far more quickly than you might think. The study showed that people can rate the trustworthiness of faces even without “seeing” them. A part of the brain known as the amygdala is involved in emotions and decision-making and it is this area that fires up when we have to establish trustworthiness. Earlier studies had asked people to rate faces as trustworthy, untrustworthy or neutral. That research had already established the role of the amygdala in making such decisions. The new study took an interesting twist. It recorded the activity in the amygdala when these three categories of images were shown to people so fast that they were not consciously aware of the face. Interestingly, the research found that the same parts of the amygdala kicked in as was the case when people were consciously aware of the images. This suggests that establishing trust is such an important part of our survival instinct that we are able to weigh up people and their likely threat to us within milliseconds. Although this new research was on faces, it emphasises the importance we place on trust and getting it established quickly. The fact that the process is taking place at the unconscious level suggests that people will have made up their mind about your website before they are even aware it has loaded onto their screens. So what do you need to do in order to establish trust in this unconscious analysis? More than anything else your website needs to do what people are expecting. If they are expecting to see a news-style website which is effectively saying “read me” then that is what it must scream to the subconscious. Equally, if the website is attempting to make people think they have the chance of a bargain, then the design must convey “cheap stuff on sale here” in an instant. 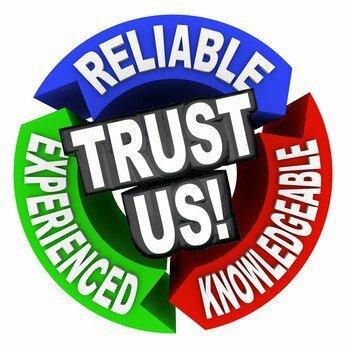 In other words, your web design has an important impact in establishing trust. Rather than focus on the nitty gritty of design, focus more on the overall message impact. Far too much time is spent worrying about colour, about fonts, column widths and so on. Much more time is needed on the subconscious message the design conveys. Focus on that, get that right and you will make your site more trusted because you will match subconscious expectations much more. It is the subconscious impact of your website which is much more important than all the feature-rich components which most business owners focus on. Those are icing on the cake – but you need to get the cake right first…!